Brand new variable speed vibrating wand! Perfect for relaxing and releasing stress. Features: 100% brand new. Variable Speed Control Wheel Home AC power (110v) compatible. 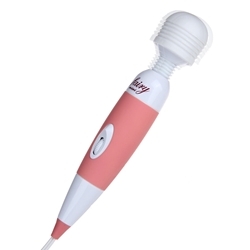 The Powered Mini Massage Wand will give you or a partner the satisfying massage you crave. Its' compact size and soft easy to grip body means that you have optimum control no matter what gets on the body, and it's rounded head with flexi-neck is perfect for getting the powerful vibrations where it needs to be.